Starting to feel a little more recovered from London M now, I was hoping of a speedy time. It was a great morning, cool and sunny. 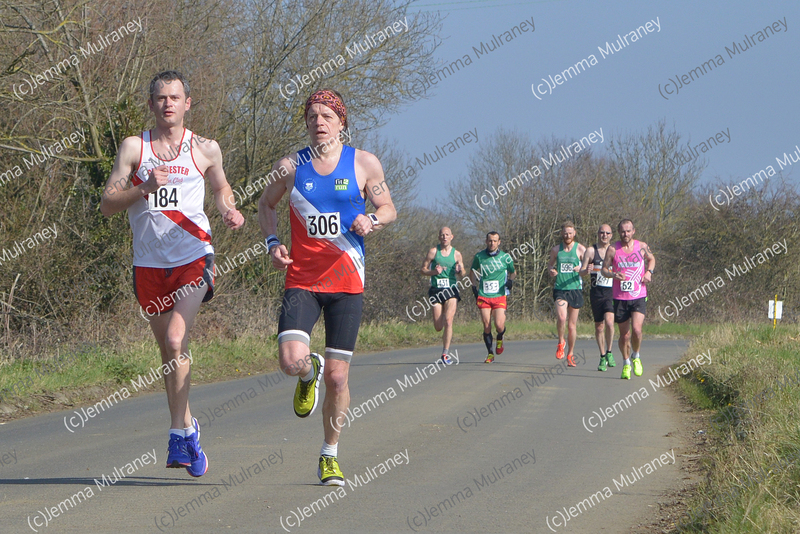 I took a longer warm up, which seems to be working for me at the moment, and lined up near the front with plenty of other OCAC runners, including Ali, who’d cheekily bet me he could beat me today. The guy next to me ask me what I was aiming for, as his watch had just stopped working, and when I said 39 minutes, he said he’d follow me through the first couple of km as a pacer. I tried to remain in control of my pace through the first downhill 1½km, and to the turn for the uphill drag on the High, where the guy I was pacing nipped in front of me. I still felt strong up the drag, passing Ali who was already fading, and knew that a sub-40 was definitely on the cards as I cruised through the Norham Gardens twisties all the way to 5km, passed in around 19:25. Coming back into the park is always tricky – the paths are only fine gravel and there are more twists and turns but I had enough left in the tank to overtake a few runners dying ahead of me and a sprint finish for a 20:02 second half. Very happy with that, my fastest Town & Gown for a few years and I still feel there’s more to come this summer. 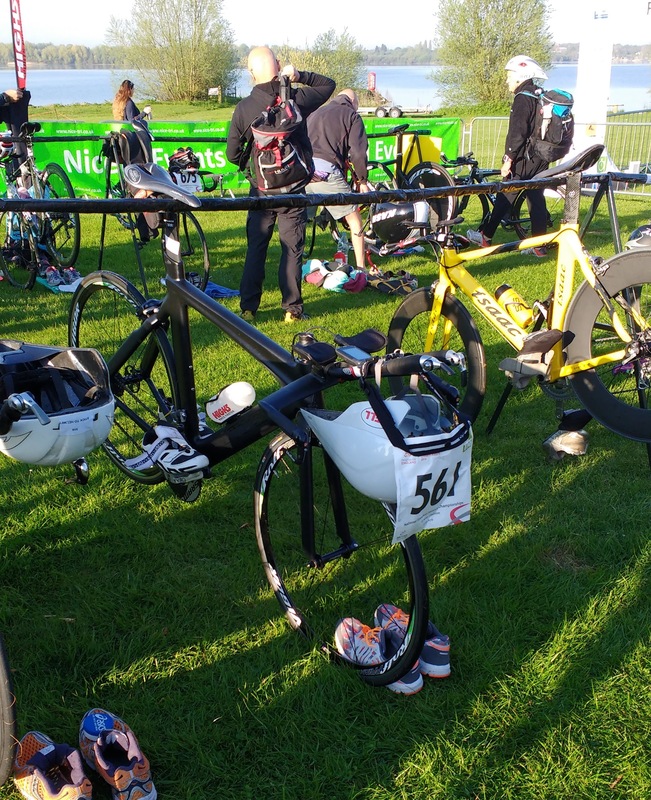 This year, NiceTri were hosting the English “standard” distance triathlon championships and as St Neots wasn’t too far away it seemed like a good way to open my account for the year and maybe a bit of a warm up for the national middle distance (½ ironman) champs a couple of weeks later. The event got moved to Grafham water due to the original venue’s field being flooded, so it was even more like a warm up for the later championships, as that would be at Grafham too. I wasn’t taking this too seriously, it’s not really my distance, but was quietly confident I could manage to finish well into the top-10 in my age group. I raced the Cambridge Urban orienteering sprints the day before, but hoped that those two short 15-minute races wouldn’t take too much out of my legs – in the end I rather made a mess of those races, mis-punching in the second one and recording a DNF. The weather was at least nice and sunny if a little cool, and we were warned that the lake would be rather cold (around 13°C). I decided to get some race experience in my new BlueSeventy Helix wetsuit. I’ve had it a year but never raced in it as I’ve found it quite tricky to get out of fast in transition – this proved to be a bit of a mistake. Into the water as the last of four wave starts with the old gits, and the water was cold but not perhaps as bad as Lake Bala. I got my head under as much as possible to try to get as used to it before the start. We didn’t hang about long and were soon off, chasing after the other athletes. I didn’t feel that I was swimming too badly, there was a little group of green-hat veterans with me, but when I came out of the water I could see 24-something on my watch so I knew I’d not had a good swim (unless it was a ‘long’ swim, of course). I stripped off the top of my suit and jogged into transition and could see that there were already quite a few M50 bikes gone, and as I struggled to get out of my super-flexible wetsuit with numb hands, more bikers were leaving. Every time I grabbed a bit of suit it would snap back, and eventually I managed to stamp the last of it off my feet and head out on the bike. Even getting out on to the road I made a bit of an error with the straps on my bike shoes and had to make a brief stop to sort it out – more time lost. I was now well down the field, and chasing hard through the earlier-starting waves, but sort of knew that the game was up. There were some large crowds of slower riders to blast past, and I didn’t use the tribars much in the first 10 or 15 minutes until I was clear of them. Coming up to the turn I could already see Peter Younghusband, the likely M50 winner, powering back towards me so I settled into gaining as many places as I could. The bike course was only 37km, so not much riding for me to make up time in my strongest discipline. The roads were a bit quieter on the way into transition and I didn’t make too bad a job of the swap to running shoes, just stopping to make sure I had some padding for my “broken” toe. I ran the first few km at around 4:15/km pace, but it felt a bit quick and I could already see many M50 numbers coming towards me from the first turn so I parked my effort at something a bit more comfortable, hoping to lift it for the final 10 minutes to the line but in the end I came down with a touch of stomach cramp and it was all I could do to jog/walk into the finish, well down on my expectations with 16th in M50. The Bank Holiday weekend after the Maidenhead 10 I piled in some more distance work, but it sort-of backfired when I started to come down with the “dead leg” in my right quad again. I’ve battled with it all winter but had to take a week off running completely and missed the White Horse Half the following Sunday which I’d hoped would be a final test of pace before London. Fortunately the rest mostly worked (I did a fair amount of cycling instead) and I was able to have one last “big week” with a 32km long run on the Wednesday morning, 10 days before tapering for London. 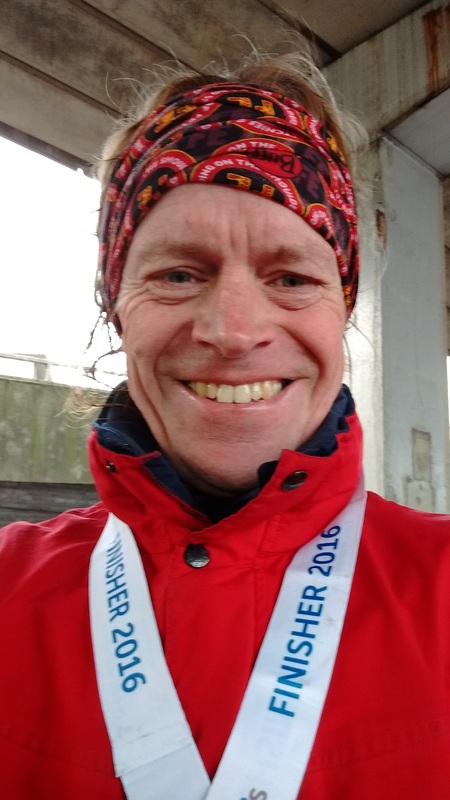 The forecast was for a cold overcast day – ideal for long distance running – and in the end it was almost too cold for me. I decided to wear a thin shirt under my OCAC vest so I didn’t feel tempted to race the first half to keep myself warm (and some quad guards to keep the chill off my legs). Two gels in my shorts pocket, and a plan to pick up two more from the gel stations at 13 and 22 miles. My brother Alan was over in London for the FA Cup semi-final and I met him on the train to Maze Hill, and we walked up the hill together to the Green Start for a few photos and a bit of a chat. It took me the best part of 40-50 minutes to queue for the loo and get my bag onto the baggage bus, but the time passed quickly with so many other runners to chat to. I was surprised to find a few first timers on this start as I though everyone was good-for-age with previous experience but it turns out that some gratis club places go on the Green start too. Off the start it’s a question of weaving past the celebs who start in front of you and then finding a pace and a space in the horde that you’re comfortable with. The Green merges with the Blue after about 1km and then it’s pretty busy. The first 5km passed in a rapid 21:24. I had even splits of 22:00 in mind, but it doesn’t make sense to hold yourself back on the downhill here. The next two splits were 21:47 and 21:48, through the crowds at the Cutty Sark. I was feeling very comfortable and trying not to bounce too much, taking a drink every so often. It was so cold though, that hydration was never a worry – around Rotherhithe we even had a 30-second flurry of very light snow. I overtook a runner dressed as beer bottle, going for some sort of record but fading already, and heard the words he didn’t want to hear “Ooh look, there’s another beer bottle”. All along here my dodgy old left calf was feeling a bit tight but it was never a problem – that’s the effect of going straight to race speed with no warm-up! After an hour-and-a-bit I’ve done the first easy 20km, and the route crosses the iconic Tower Bridge. The crowds are once again massive and vocal here, and running across this landmark made me smile from ear to ear. That smile carried me to a 21:41 5km split and then along The Highway was the Fetchpoint crowd, always a big boost (I was wearing a Fetch buff) and then the halfway mark, reached in a comfortable 1:31:23, where I picked up a gel for the tricky Isle of Dogs. This was where the wheels started to come off in 2014, but this time I was feeling good and running well on the twists and turns, almost racing them at times. I got a little carried away perhaps, with splits of 21:28, 21:31 but was very happy to see the back of this section and back to The Highway, Fetchpoint, and the stretch for home. Along here the “broken” toe on my right foot started to hurt quite a lot – I’ve never really tested it beyond 32km at this pace before – it was painful, but manageable, I just had to make sure I didn’t bounce on it too much. Through the final run along Tower Hill and Thames Street and the big underpasses, I was just waiting for The Embankment and a sight of the Elizabeth Tower (Big Ben). There were runners starting suffer all along here – some walking, some stopping for a stretch. I was weaving between them but a little bit of cramp was creeping in, I could feel the tell-tale twitching in my toes and calves. I was just trying to relax my stride, keep it all together, stick to the blue line, and a little bit of urgency went out my pace now the end was close: a 21:47 split. Finally we’re on the Embankment, and the last couple of water stations. I took a drink somewhere along here but hardly sipped it, my stomach was also starting to play up a bit. I was thinking all the time of a nice relaxed style, head up, look ahead, keep the cramps at bay, although I’m sure I didn’t look too relaxed at this point. Finally, we turned onto Birdcage Walk. I didn’t have any more to give and stumbled my way through a 22:20 split for that 5km. 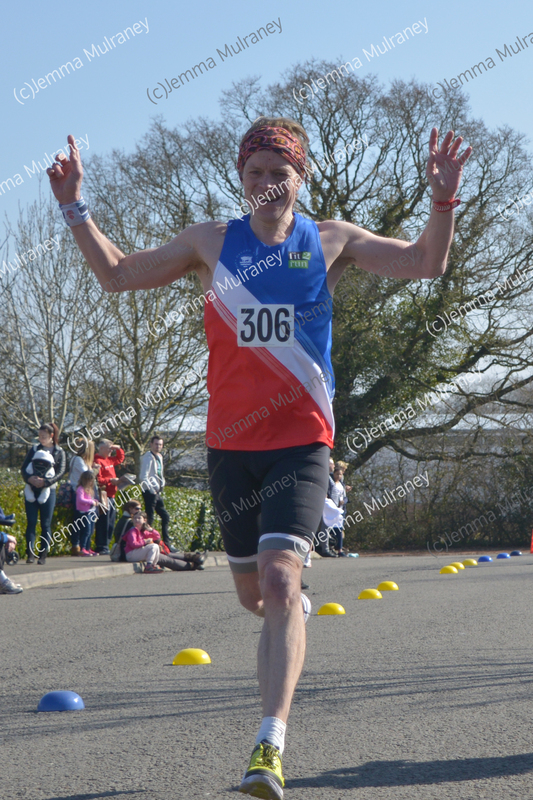 The final run to the line was hard – my stomach started to cramp up and it was all I could do to hold my head up for the finish gantry photo, much relieved to finish inside my best hope of a 3:05 finish with 3:03 (2456th overall, and 148th in the M50-54 age category, which was won in a frankly ridiculous 2:32!). 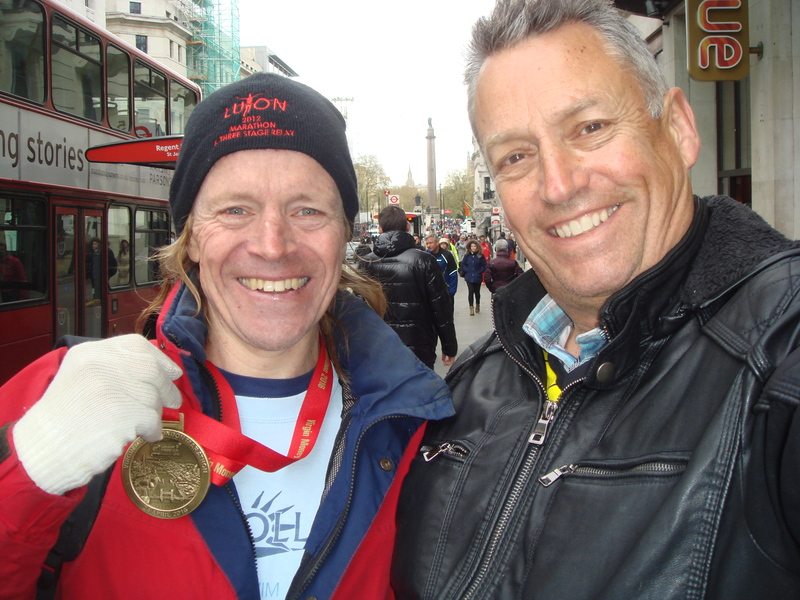 After gathering my wits and getting changed I met my brother – I think he’d struggled to keep pace with me via London Transport ;) but we a had a bit of a chat before he had to head off to Wembley for the cup match (they lost 1-2), and me to Marble Arch and the bus home. 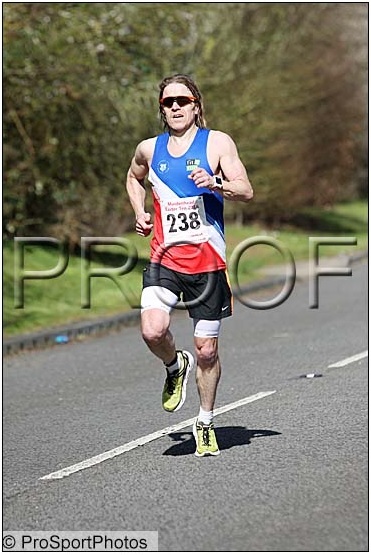 Now that sub-3 hours is so close, I’m starting to wonder if I can do it at Abingdon marathon in October, which I’ve already put an entry in for, although that’s a vastly different event – I’d be running on my own for much of it. There is always, of course, another London Marathon next year, now that I’ve garnered another good-for-age entry time! My 32-year-old 2:45:27 PB still looks a bit out of reach though. This a race I’ve done a few times before – always a good test of fitness before spring arrives – with a best of 1:02:48, set in 2004. The last couple of races I’d done this year I had finished strongly, so today I decided to go out as hard as I dared and hang on, just to see how fast I could go. We were lucky with perfect conditions, just like the Gloucester 20, cool and sunny, and after a decent warm up I was ready to go. After a couple of brisk laps of the business park where I was nearly tripped up, I was caught by a familiar face – Rob Webster of OCAC – although he was running in a Woodstock Harriers vest. Although we were ticking along at 4min/km pace we had enough breath for a chat. Rob had changed to Woodstock for the road (but not track) as he couldn’t get into the strong OCAC team! We were stride-for-stride through the next km and then I let him go as I just feeling the pace a bit. Out into the countryside I caught another Woodstock vest, Jake Harrison, who I know from Oxford Tri. We also had a bit of a breathless chat – he was home from uni. Around the 8km point I was starting to think I’d started too fast, but I was determined to try to test myself. Jake reached for a gel here and as he hesitated to open it I pulled out a small lead. Up ahead I could see Rob was dangling off the back of a bunch, and I wondered if I could reel him in. I passed a few runners and closed on him a bit, but by 11km I knew the game was up, I didn’t have much energy left. Back to the Gloucester 20 for the third year in a row. It’s a good little race for preparing for London marathon, but every year seems to mark the point where my right quad fails and the last few weeks go downhill (in fact, after this race last year I decided not to run in London at all). It’s been behaving itself a bit better this year but I was still cautious of it although this year’s Gloucester 20 was further away from London, at 6 weeks, than the 4 or 5 it’s been in the past so perhaps if things went badly there would still be time to turn it around. After a bit of a jog to warm up (my sore hip seems to have settle down now) I decided to just wear a vest to run in. It was cool and sunny, pretty much ideal conditions, I was feeling pretty good, if a little nervous. Off the start we had a couple of laps of the local business park to run and then out into the countryside. Although I was thinking of a 2:20 finish I didn’t get too carried away with these opening km, they seemed quite brisk enough and it wasn’t until I was coming around to the end of the first of three large laps that I found myself in a smallish group although they soon split up and I was just running with one other guy from Gloucester AC who was getting a lot of cheers from the marshals. We had a bit of a chat – he’d missed quite a bit of training with a bad cold. I walked through the water stations – the water is handed up in cups at this race which isn’t the easiest to deal with – but I don’t think it was costing me much time. I had a couple of gels tucked into my waistband for the second and third laps and they provided a welcome boost. I was still feeling good coming around the back half of the last large lap so I pressed on a bit here, and kept a slightly faster pace all the way to the finish, catching dying runners all the way to the line. My 10 mile splits were roughly 1:10:34 and 1:10:04. Very happy with my time, 80th from 500 starters and 6th M50, and my quad was not too bad at all – I managed an easy jog to warm down before climbing into the car for the drive home. Blimey, the queue for the pay-and-display machine was longer than that for the loos! I warmed up in a jacket it was so cold, and then nipped into the leisure centre for a final pee before making my way to the baggage area and race start. I had a steady start, thinking of a 1h30 finish, not sure how my hip was going to cope after yesterday’s parkrun when it felt so tight at 4:10/km pace but hoped that my nice squishy Hoka Odyssey would do the trick. The 1h30 pacers took off at 3km never to be seen again (! ), but I stuck to my plan. I think they finished in sub-1h28, naughty boys. I found had plenty in reserve for the rolling first half, overtaking all the time from about 8km onwards (a brass band was playing Hey Jude, cool) and stretched my legs out on the gentle descent from 13km onwards. Started to really push with 3km to go, racing the last 5km in around 19:45, a great way to finish. Feeling so much more confident in my sore hip today. Eight weeks to go to London Marathon is usually the point where my good winter starts to fall apart, so I’ll be keeping a careful eye on every single creak and twinge from now on! Amazingly (given how often I run/race), it’s taken me until today to get round to doing a parkrun. A spur-of-the-minute decision just before leaving work on Friday afternoon saw me walking out the building with a sheaf of barcodes in hand. After all, I had nothing better to do on Saturday morning. Although… I must admit that I would normally treat myself to a bit of a lie-in on Saturday as I usually have an early start the rest of the week, and the hair-shirt in me says that as Oxford parkrun is only 9½ km away, I should be cycling there which is FAR too much hassle for before 9am. But today I had no excuse and got up early for the trundle on my bike around the ring road cycle path. A nice, crisp morning greeted us and after a brief intro from today’s race director where I put my hand up as a newby, we were off. The first 200m were fast and then I remembered I’ve got Coventry half tomorrow and backed off a bit! Good fun all round and I guess fairly informal, it was nice to have something short and sharp under my belt before 10am even if my sore hip didn’t appreciate it much, and a bit of a chat to some familiar faces and another parkrun first timer friend-of-a-friend. And then as I was warming down I saw another face I recognised from Fetch – iPLOD was out for a run too – so I introduced myself and we finished another half lap together, chatting about running and so on, like you do. Then I just had an easy cycle into town for a coffee and some dull stuff to do at my bank. Sorted.